We all know what is like to win when playing our specifically chosen numbers in a game of keno. There is a sense of gratification, like when the lady giving out free food samples forgets you already had one and gives you another. While both land-based keno, at your local pub or RSL, and online keno have their benefits, online games have a significant advantage. Online offers you a lot more gameplay options, higher potential winning payouts and the convenience of playing from home. Keno number patterns are used by many fanatical form fillers, so we have decided to take a look at what they’re all about and whether they increase your odds, while also recommending some great online casinos for you to test with your favourite keno number patterns. If It’s A Game Of Chance, Why Use Patterns? Additionally, our subconscious instinctively recognises patterns, so when three or four numbers make a pattern over and over again by being right next to each other, we can’t ignore it. This is also the reason why we don’t seem to notice when a pair of numbers two rows down and three rows to the left of another number keeps popping up. They are too far away from each other for our brains to consider them part of a recurring pattern, but it happens just as often as the easily recognised three-in-a-row does, so keep this in mind. Everyone enjoys using personal dates when playing lottery games. The problem with this is, if you do pick common holiday numbers, for example 25 for Christmas, it is more than likely others have done the same thing. The more people that pick the same numbers; the more likely you will have to share the jackpot if you win. However, this idea doesn’t apply to keno thankfully, but rather online bingo, so if you enjoy making your own personal number pattern based on those special dates, go ahead. The reason this idea does not apply to the game of keno is because keno uses a payout schedule (payable or pay-scale), and it does not matter if every other person playing chose the same numbers as you did, because you will still be paid out the same. A winning keno combination is likely be some random combo of numbers which will never have any bearings on previous draws, but if you are one that finds using personal numbers more interesting, then go right ahead – you aren’t reducing your odds by doing so, so it can certainly make the game more enjoyable. Playing keno online for real money as opposed to playing at your local pub or RSL is not only better value for the player, but you don’t have to scrounge around for coins or be embarrassed you didn’t win when you get your ticked checked by that attractive bartender. Playing in the comfort of our own home is what online casinos are all about, and frankly we are ecstatic we don’t have to search the pub for a sharpened pencil to fill our form out. Online casino keno allows you to play new rounds at your own pace in your own home, and to purchase tickets for spots to be used over several draws rather having to set spots for individual games. Spend as little or as much as you want when playing online. On of our top endorsed online casinos to play keno is Royal Vegas. 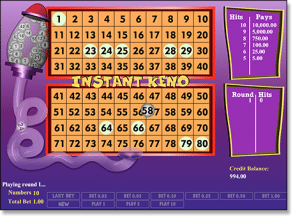 Powered by Micgrogaming, online keno is played on a slick interface you can use with ease. You get the choice of different gameplay modes with great interactive graphics. We also like Emu, Casino-Mate and All Slots Casino for a range of different keno variations and interfaces. These platforms are powered by a range of different casino software developers, often inaccessible on other gambling websites, and their keno offerings are hosted by NetEntertainment, Leander Games, NYX Gaming and other top leading and reliable software providers. All our recommended online casino sites are safeguarded by 128 Bit Secure Socket Layer (SSL) encryption technology which is the same software which protects your transactions when purchasing your goodies online. Online keno payment methods are in abundance too and it is easy and safe to both deposit and withdraw AUD cash to play. To play keno, all you need is an Internet connection and a deposit method of your choice. All major banks are supported for bank transfers (ANZ, Commonwealth, NAB, Westpac), and credit/debit cards (MasterCard, Visa), cheques/checks, e-Wallets (Neteller, POLi, Skrill/Moneybookers) and prepaid services (Ukash) are supported, too.